Walter Crane’s work on children’s book design with Edmund Evans and Routledge progressed into a profitable career. Despite this success, Crane still longed to move away from children’s books, and diversified his artistic talents by also contributing to the decorative arts such as tapestries, gesso reliefs, embroidery, and stained glass. From early on in his career, Crane was considered to be one of the most successful children’s book illustrators and was in high demand. He spent a great deal of time considering children’s perspectives when designing his illustrations and planned his designs accordingly. 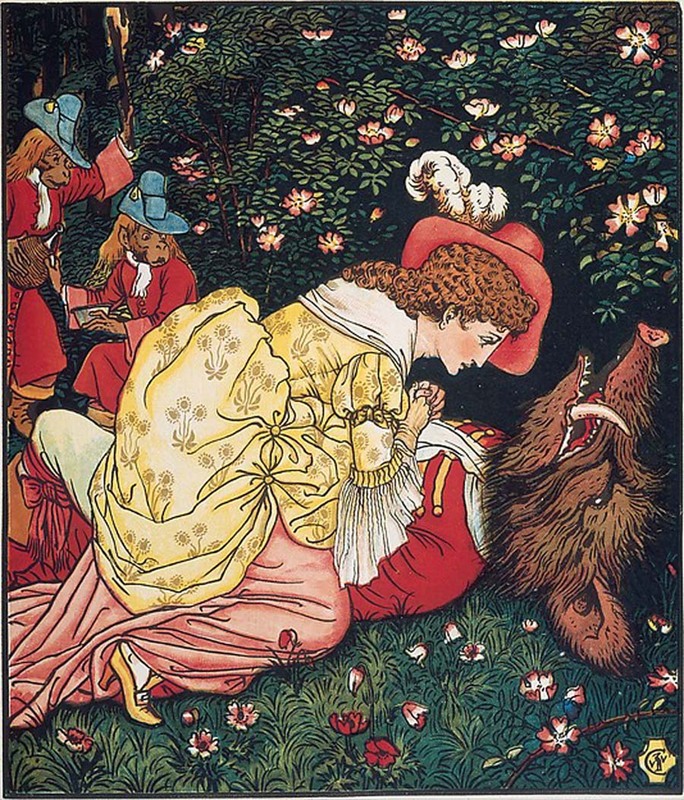 Crane had theories about children’s visual abilities which can be seen in his illustration for Beauty and the Beast, such as his theory that “children…appear to see most things in profile,” and that they “prefer well-defined forms and bright, frank colour. They don’t want to bother about three dimensions.”1 When Beauty and the Beast, was released, editions of The Frog Prince, and The Hind in the Wood were also published and mentioned in the British newspaper, The Spectator. This scene from Beauty and the Beast shows Belle kneeling over the Beast. She has a dream and goes in search of the Beast, only to find him lying on the ground having fallen ill. Belle confesses her love for the Beast and breaks the curse, turning him back into a man. 1. Susan E. Meyer, A Treasury of the Great Children’s Book Illustrators (New York: Harry N. Abrams, 1987), 88. 2. Lane, John. “Beauty and the Beast Picture Book. Illustrated by Walter Crane,” The Spectator, April 27, 1901, pg. 50. http://archive.spectator.co.uk/article/27th-april-1901/50/beauty-and-the-beast-picture-book-illustrated-by-w.